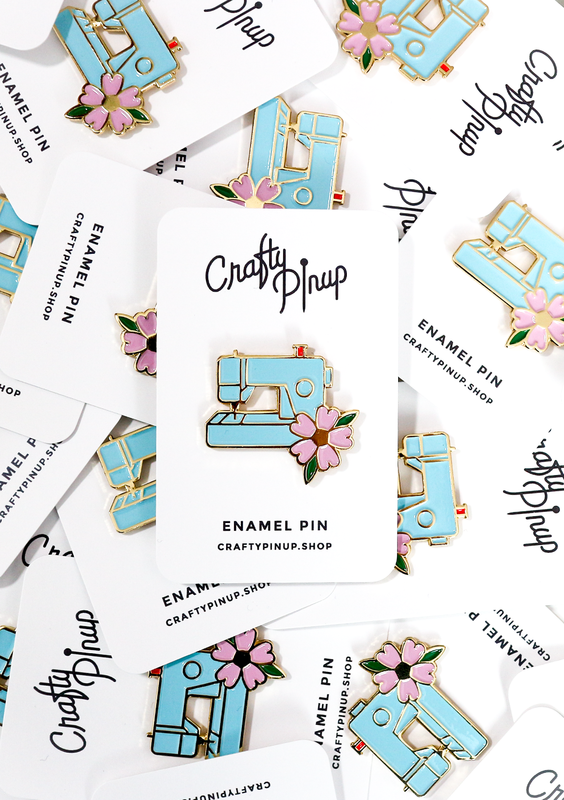 Crafty Pinup Shop | Christmas Pin Bundle! Hi pinups! 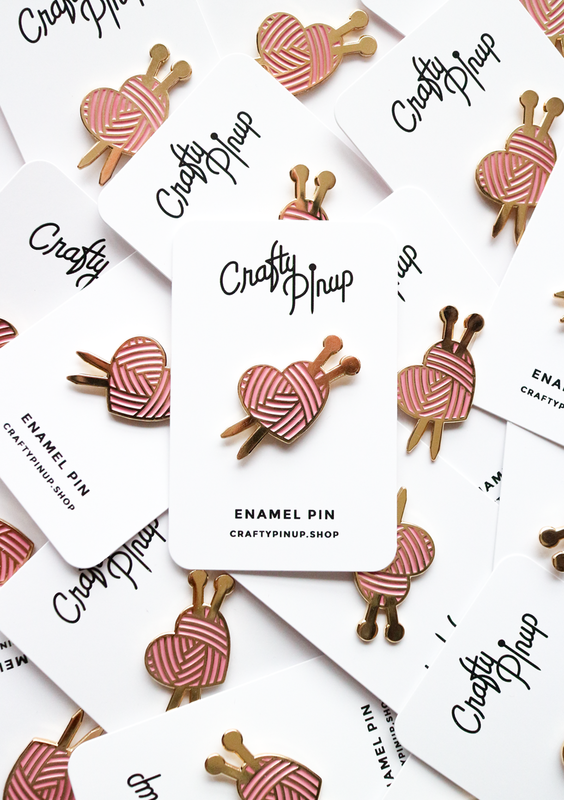 Just a quick one to tell you about the launch of my brand new Love Knitting enamel pin and a new limited time Christmas bundle offer! 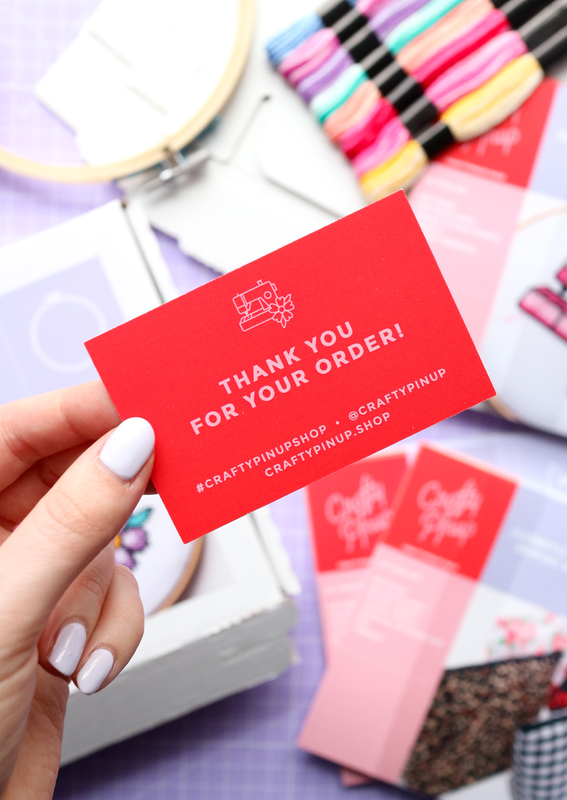 It seems a bit late to introduce you to my mini shop now, but here it is! 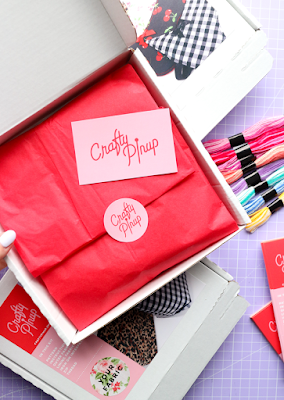 My Crafty Pinup mini online shop is now open for business. I'm starting with some cute sewing & knitting themed accessories, with some sewing kits round the corner. My first batch of Sewing Machine pins and 'I'd Rather Be Sewing' tote bags were a sell out (amazingly! ), but they're both back in stock along with my new Love Knitting design. 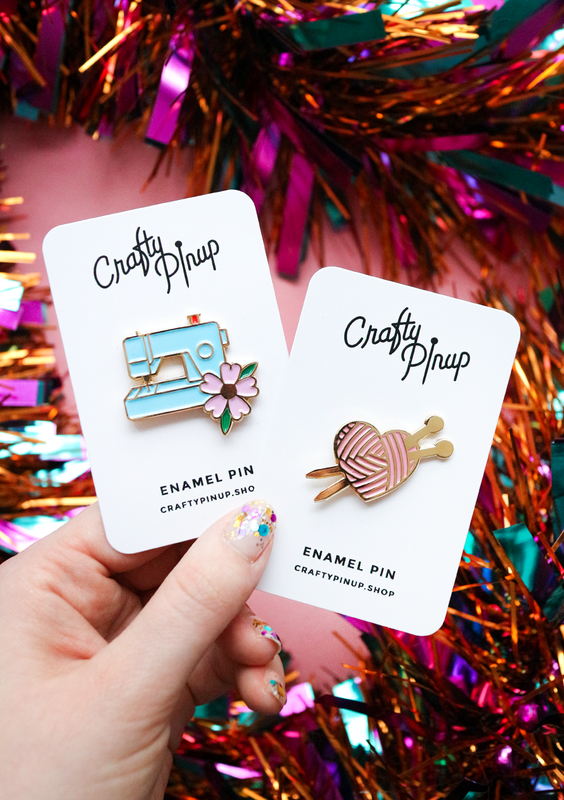 To celebrate my shop being fully restocked and with Christmas on the way, I thought I'd pop my two pins together for a 20% off bundle offer for a limited time only! Crafty Pinup Sewing Machine Flower enamel pin badge! Featuring my tattoo inspired sewing machine flower design, wear your seamstress pin with pride! 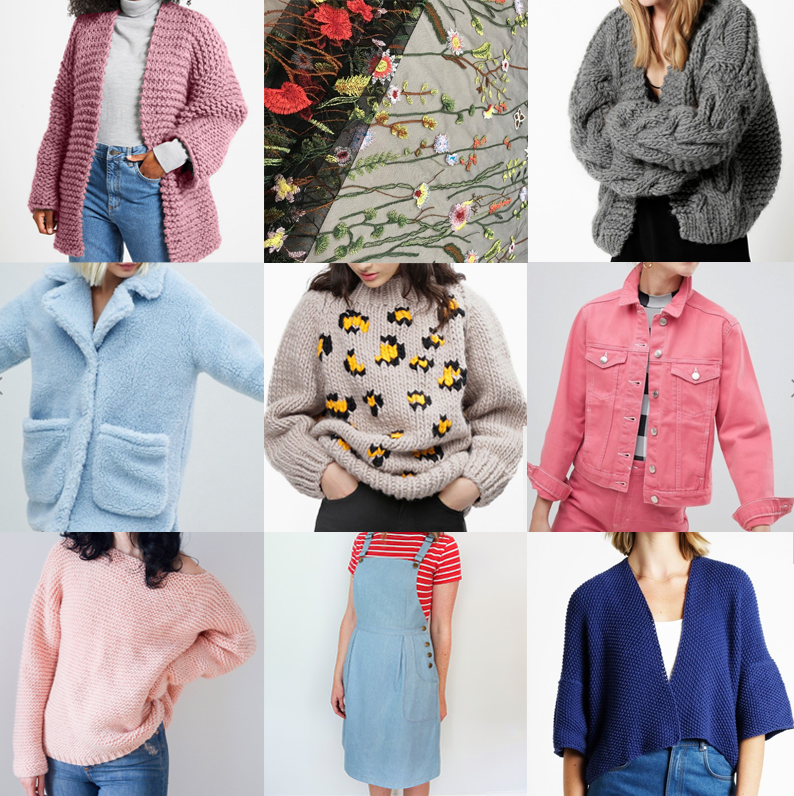 Perhaps you'll be pinning it onto your latest handmade coat? The 2 black rubber clutches will keep this pin extra secure. I'm wearing mine on the pocket of my new handmade denim jacket! 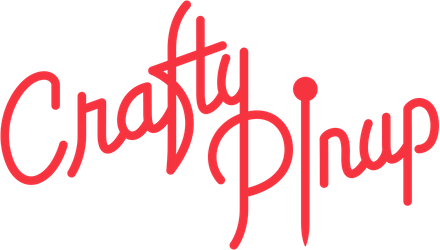 Crafty Pinup Love Knitting enamel pin badge! Featuring my tattoo inspired heart shaped ball of pink wool with crossed chunky needles, 15mm bamboo needles are my weapon of choice... I'm wearing mine on red beret! 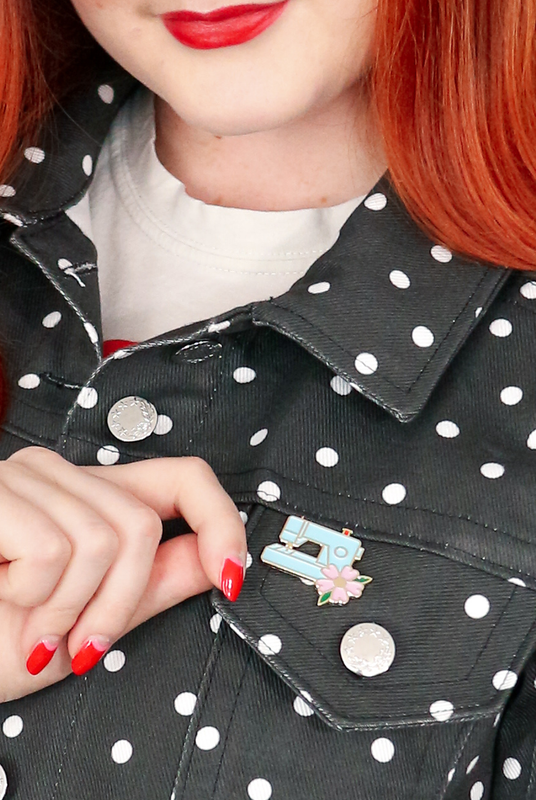 I really hope you love my new enamel pin range! Thank you so much for the amazing support I've had so far and for the wonderful sales that make this all possible. I'm so excited that my shop is finally open as I've wanted to do it for such a long time. 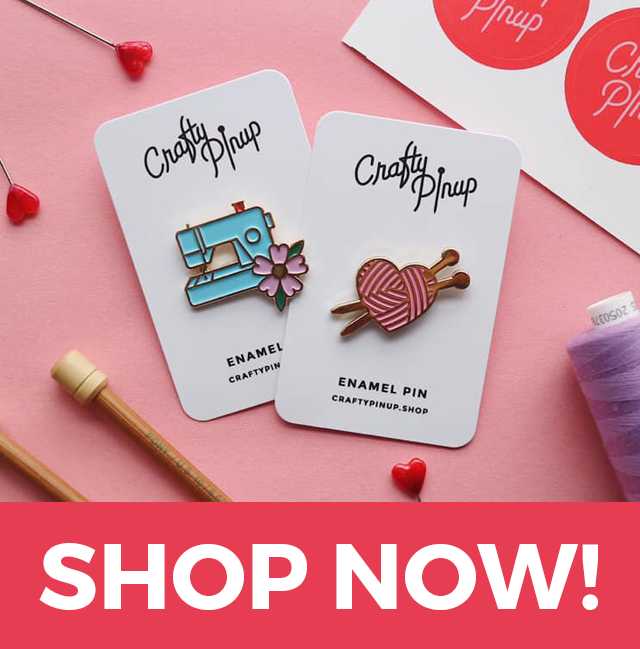 So treat yourself and your crafty pals this festive season with something from my Crafty Pinup shop! Hi pinups, I've been so excited to share this make with you! This is a project I've been wanting to create for such a long time now and I can't quite believe it's finally finished. 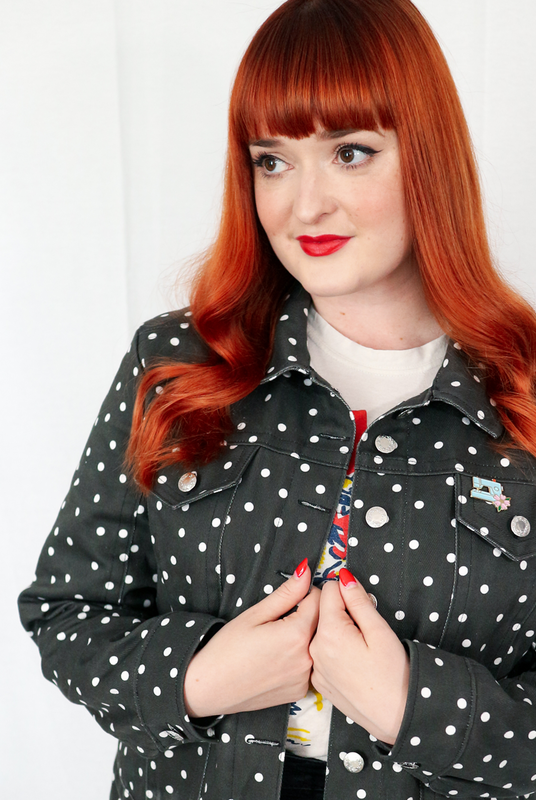 I've wanted to make a polka dot denim jacket for over a year but never came across a suitable fabric until now. I used the opportunity working with Spoonflower to finally create one of my dream sewing projects! 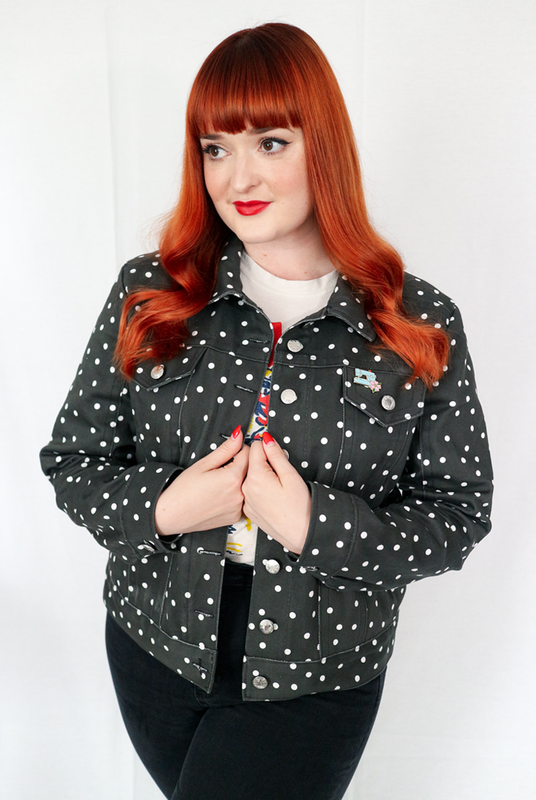 The Seamwork 'Audrey' denim jacket seems to be a really popular pattern. Like I always do, I trawl through the Instagram hashtags for inspiration and for any fitting or technical issues to look out for. 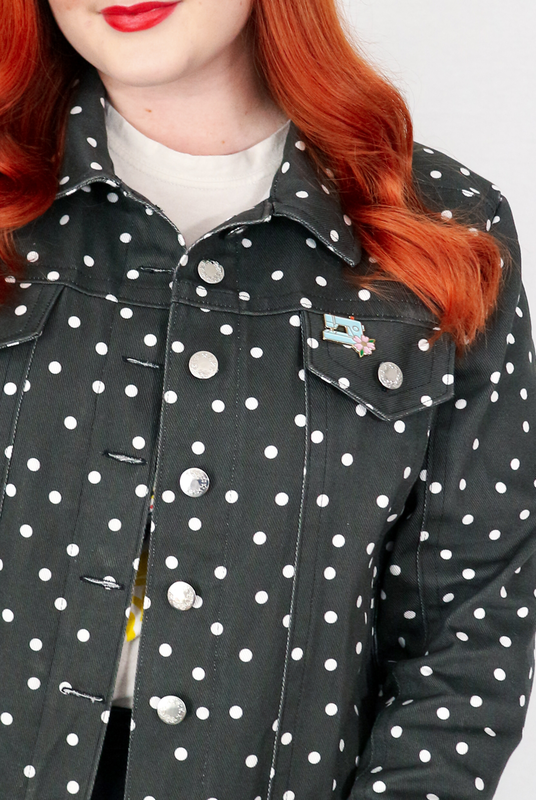 But luckily the Audrey denim jacket seemed like a pretty solid pattern with lots of people loving it. 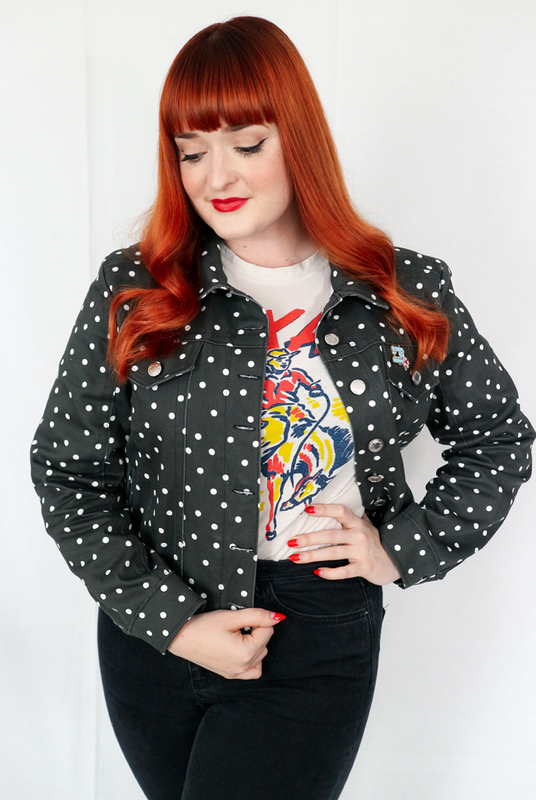 I thought it would be the perfect classic denim jacket pattern for my polka dot denim dream make. 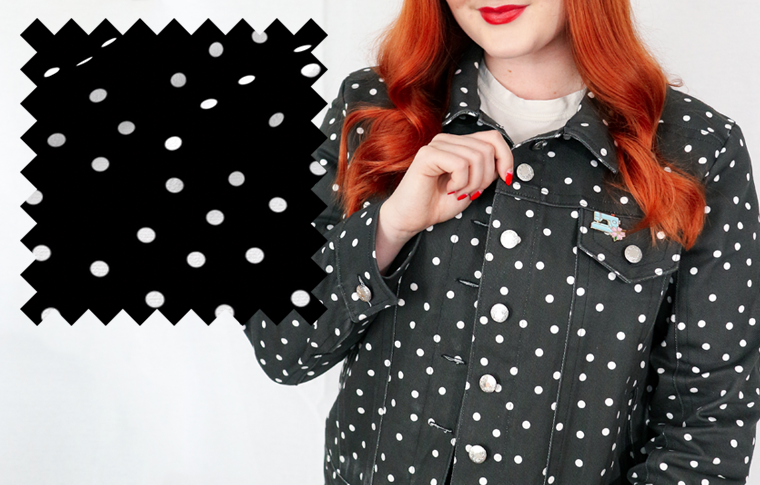 I've been searching for a decent black and white polka dot denim fabric for quite some time but never found one I liked enough. 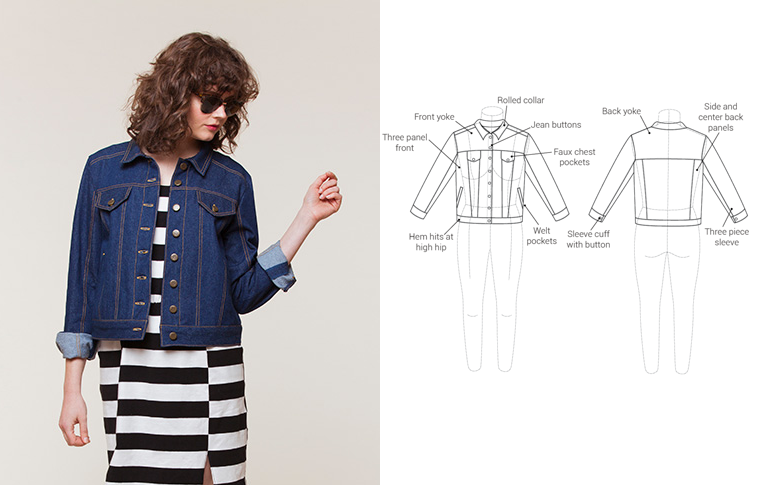 I had a sample of Spoonflower's Dogwood denim and it's a great weight for a denim jacket. After a quick search of 'polka dots' on Spoonflower, I settled on one I liked. I knew I wanted a classic black and white colour and I love the random spots instead of uniform spots. It was exactly what I wanted! When the fabric arrived I was worried the fabric might be a little stiff but after a wash the fabric was perfect and armed with a denim needle on my machine, I was ready to go! My sturdy Janome Atelier 5 sewed this like a dream. I really enjoy topstitching and luckily there's lots on this pattern which I absolutely loved. 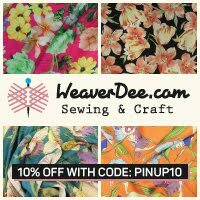 I was a bit intimidated by the pattern as I haven't sewn anything too technical recently but the reviews I went through online reassured me it was straight forward. Having sewn my fair share of shirt styles and a couple of coats the pattern was reasonably similar design wise. I made sure to have a good read through of the instructions first, something I'm guilty of not always doing, and made sure to take my time and not rush. Whilst I found the instructions of the pattern pretty straight forward to follow overall, I still can't get my head around welt pockets! I struggled on this step and didn't find the pattern's instructions too helpful here. It was much clearer when I looked for tutorials online instead, but luckily there's loads out there. My first attempt was a bit of a mess, but luckily you can't see my struggles from the outside! My second pocket was far better and I had a better understanding of the whole process then. However I still haven't fallen in love with welt pockets yet (this is my second garment trying them), but going forward I think I understand them a little better to try again with more confidence. The fit of the jacket is exactly what I wanted. After looking on the highstreet earlier this year for a denim jacket, trying to find a women's one which isn't cropped was a flipping nightmare! So the boxy, full length style of the Audrey pattern was a relief. I wanted a size that would be big enough to layer up with a jumper underneath in colder months, but not look too oversized in Spring. I think my one is a good balance. My first attempt at a denim jacket was a couple of years ago. At the time I was really proud but it didn't really hit the mark fit wise and definitely had a couple of sewing mishaps. That resulted in me barely wearing it and it was such a shame, so that experience put me off the idea of sewing a denim jacket again. But this was a world apart from that experience! Sewing time: I made this over a couple of days. Difficulty: I'd recommend this pattern for seamstresses with a bit more experience. Some denim and shirt construction knowledge would help. Watch out for: Those tricky welt pockets. Make Again? 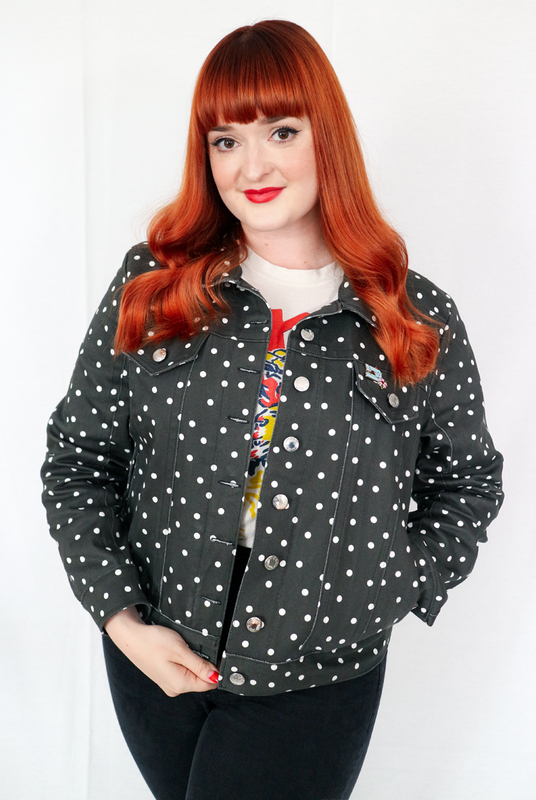 : I don't know how many denim jackets my wardrobe needs, but I would 100% recommend this pattern and if I wanted another (baby pink perhaps?) this would be my go-to. 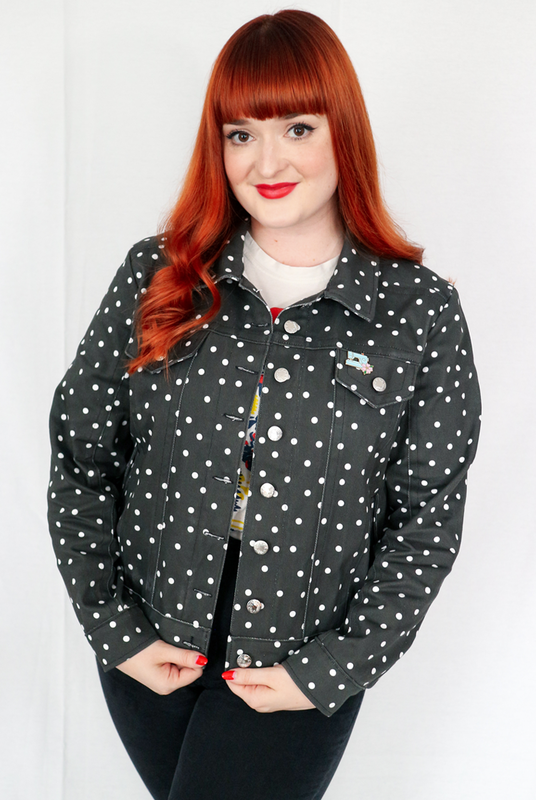 Overall, I love my new polka dot denim jacket! Even though my post for this jacket wasn't due until November, as soon as the fabric arrived on my door step a couple of months ago I couldn't wait to sew it up. So this fabric has now had over a month of wear and I am obsessed with it! I don't think I've ever worn a handmade garment so much so quickly after sewing it and the fabric has softened up really nicely. It's been such a great addition to my wardrobe and I'm so pleased the dream project I've had in my head for over a year was actually successful. Especially as I've been trying to be more conscious of my sewing choices recently to sew more sustainably. 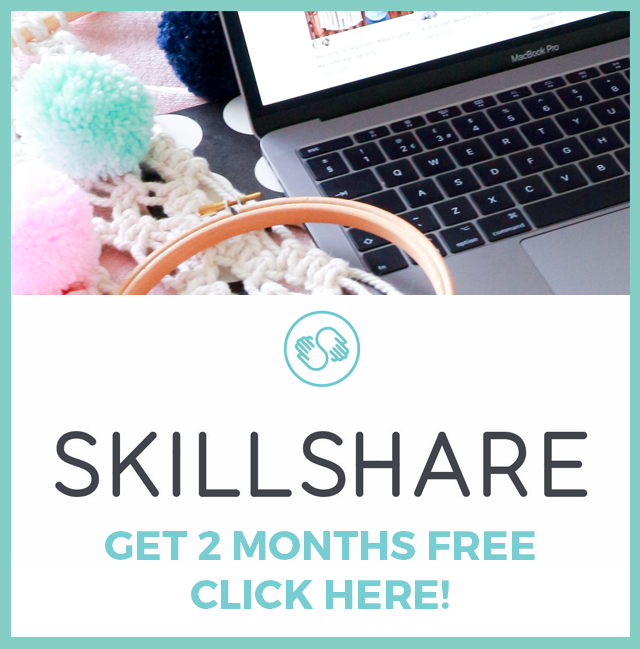 Don't forget to visit Spoonflower today for thousands of unique designs! The possibilities for prints on their dogwood denim fabric is endless. Imagine this in a floral or classic gingham.... love! P.S. 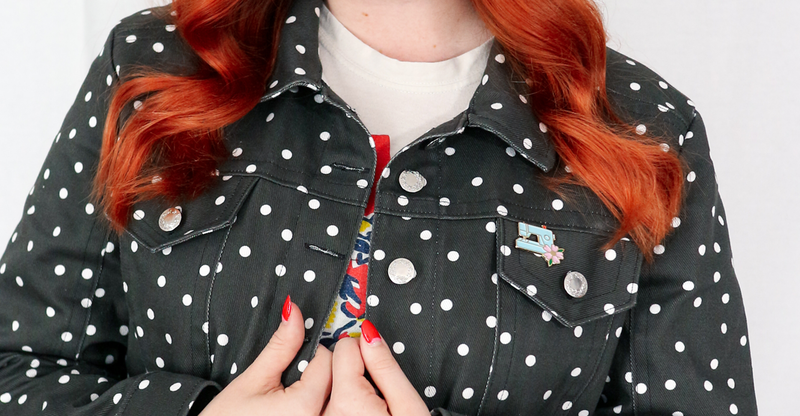 Did you notice the cute little sewing machine pin on my jacket pocket?? It's my own design and available to buy in my new online mini shop! As I'm typing this, the pin is currently sold out, but there's a big batch on the way to me and it'll be back in stock by the end of November. Check back HERE to buy yours! A Spontaneous 1960s Coco-Françoise Mash up! Hi pinups! Here's a blog post that's come totally out of the blue... I had literally no intention of sewing anything for myself this week, let along taking photos and writing a blog post, yet here we are! Sometimes the spontaneous ones are the best ones and this mash up of patterns fits in quite nicely with the #stitchedwithatwist Instagram sewing challenge too. I'm a total morning person and you'll never catch me sewing much past 3pm. But once in a blue moon, most likely after a low sew-jo period, I'll have a surge of energy to sew something for myself in an evening. It's very rare but has been known to happen on occasion. 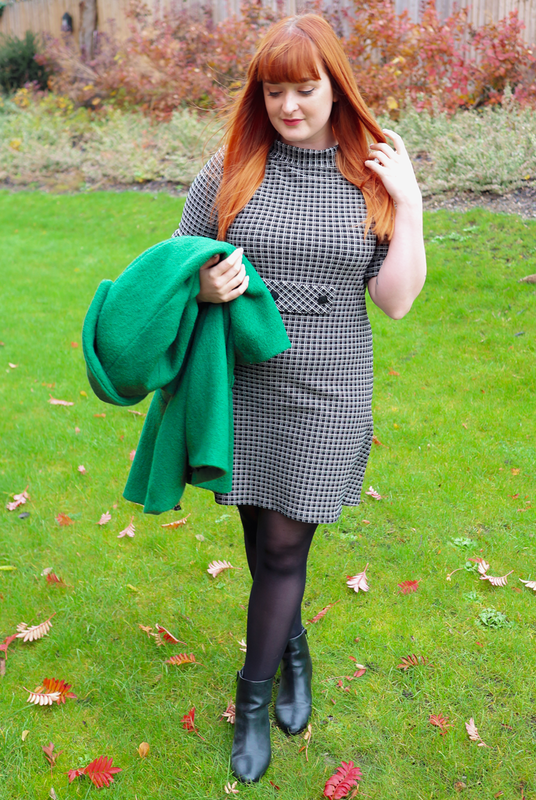 And that's exactly what happened with this Tilly and the Buttons Coco-Francoise dress mashup. 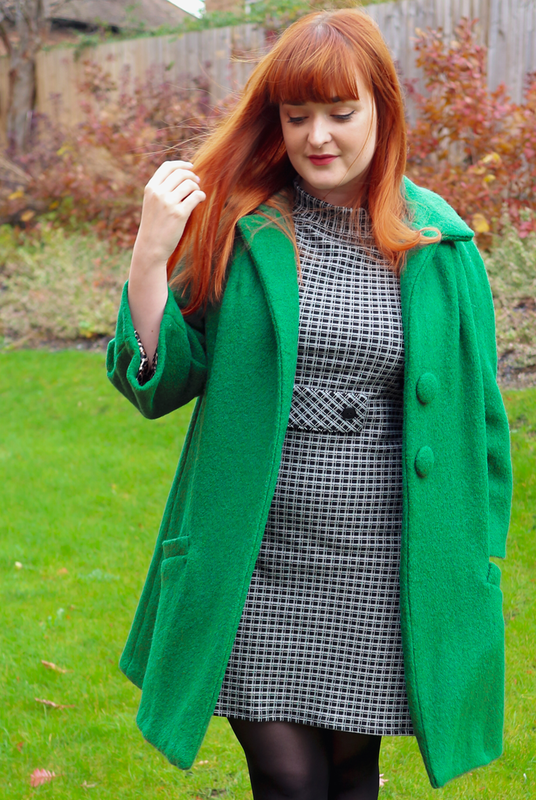 Now I wouldn't say there's a whole lot of vintage style in my wardrobe these days but when it comes to Autumn/Winter I LOVE a bit of 1960s style. 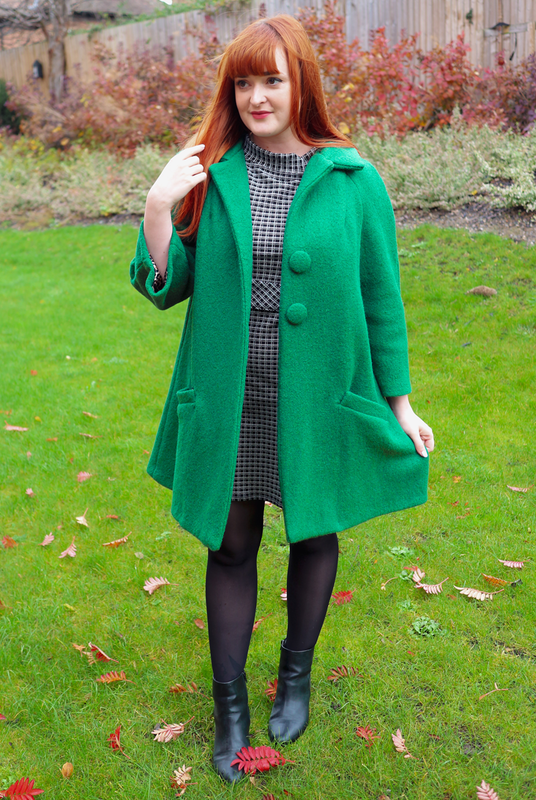 I made this Simplicity 1197 coat a last year and you can see the original post HERE, but if I'm honest it hasn't gotten the wear it deserves. 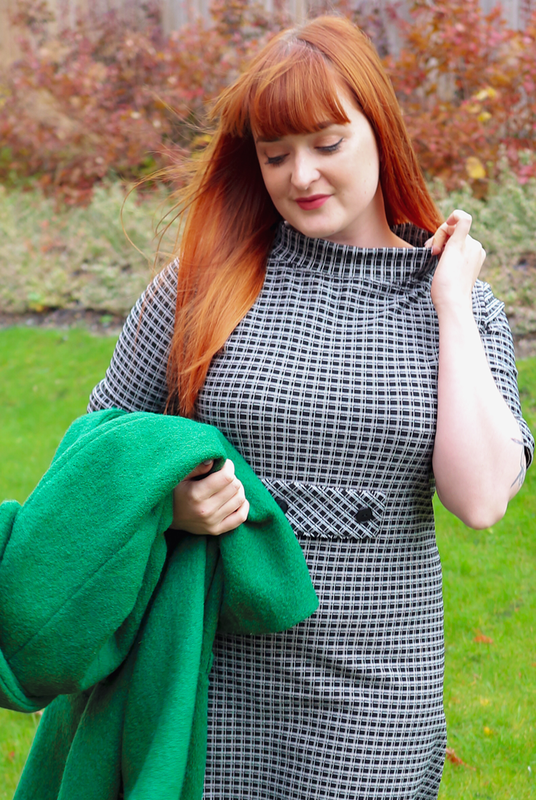 If you caught my post about sustainable sewing and making an effort to restyle and wear my old makes, you'll know I'm on a bit of a revival kick, trying to see some of my previous makes with new eyes. Now don't get me wrong, I love this coat. It was pretty much my dream coat come to life. But the practicalities of it left me choosing to wear my other coats instead. For me it's the sleeve length, which is a classic 3/4 length sleeve. 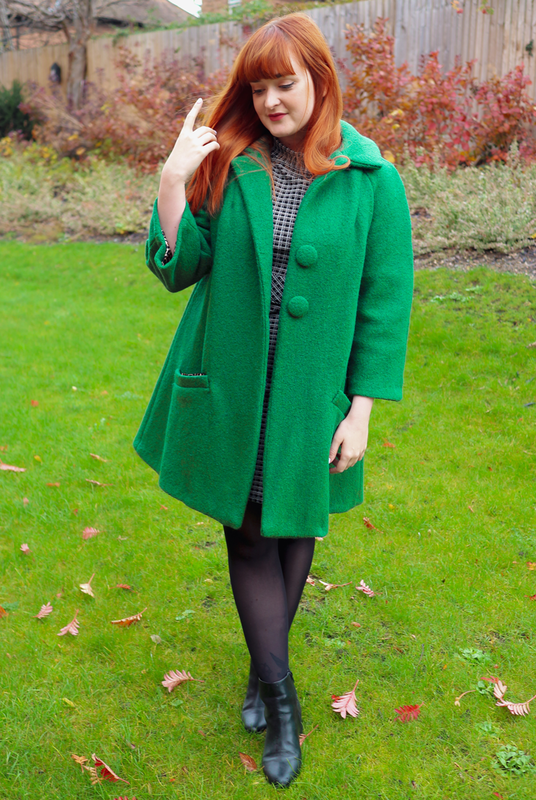 I love the style and it adds to the retro look, but when the weather got cold enough to wear it, none of my gloves were long enough and I didn't like my clothes' sleeves poking out. Now I know this all sounds very trivial, but that small detail meant I wore other coats more. Anyway, a year too late I've finally bought some long wooly black gloves to wear with this coat and I plan to wear it a lot more this time around. Let's get back to the dress... I've had this fabric in my stash for a couple of years. I knew I wanted to make something retro out of it but with (I think) 1.5m I didn't have enough for a dress, or so I thought. I pride myself on my ability to get a dress out of small amounts of fabric, and with lots of head scratching and rotating, I can't quite believe I managed this one! It's the Coco dress pattern and I've had to shorten the sleeves a lot and also make the cuffs a lot narrower than the original, but I'm so happy with the outcome. Then with the very last scraps, I added a button waist detail which I pinched from the Francoise pattern. 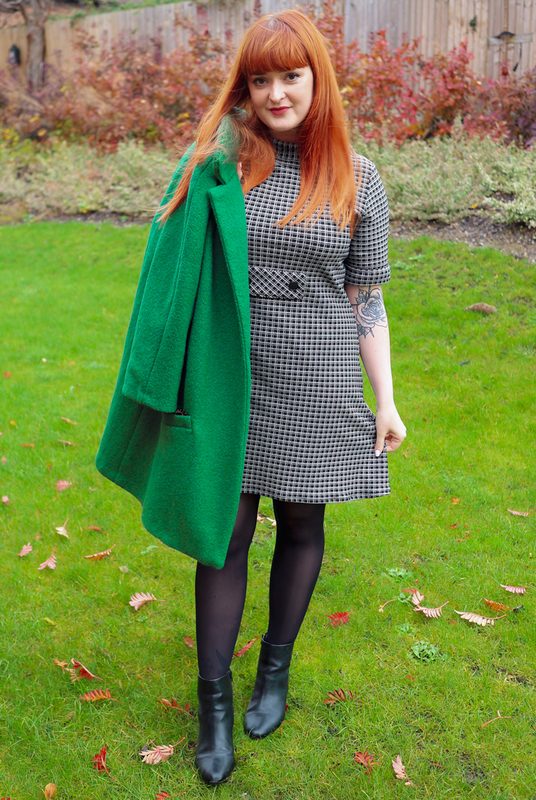 I love this dress paired with my old Simplicity coat, this might just be my new favourite outfit. I had toyed with the idea of sewing Tilly's Francoise dress pattern in a jersey and omitting the zip, but this seems like a much simpler way to get the look of that dress without having to experiment. As I feel like I know the Coco pattern inside out, I might try adding the collar from the Francoise onto my next. So this Coco-Francoise mashup is my entry for the #stitchedwithatwist Instagram challenge which the lovely ladies @I_seam_sew_happy and @oh_liverpool_lou asked me to be a part of. Find out all the info on the competition HERE - there's some amazing prizes to win and they need your entries by 24th November. Whilst this make and blog post was totally out of the blue, it's all worked out quite nicely for me! I don't have too many sewing plans at the moment because of my work commitments (I can't believe my mini shop sold out in a week!! ), but my fabric stash is looking pretty healthy at the moment and I'm sure another random make won't be too far away! 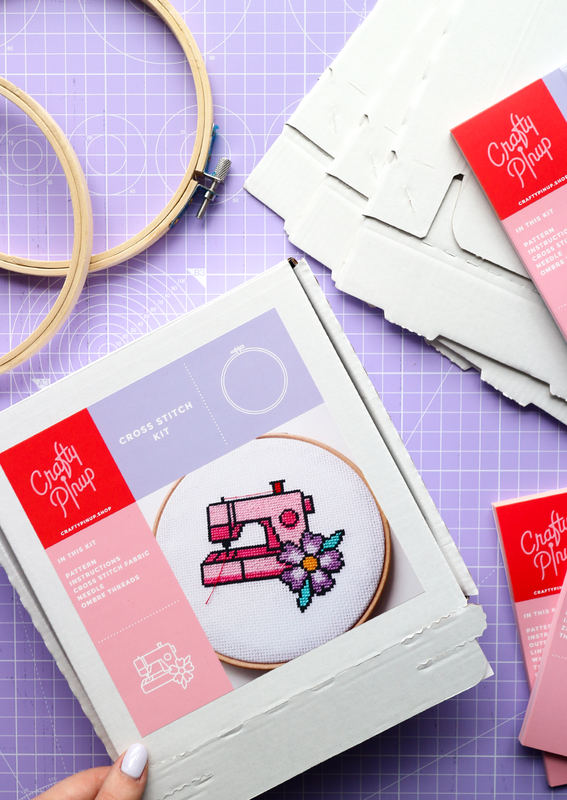 Creating a collection of sewing kits has been a long time in the making for me, but when Lil Packaging contacted me earlier this year and introduced me to their range of eco-friendly packaging, I took it as the sign I needed to finally crack on with designing my kits and opening a shop! 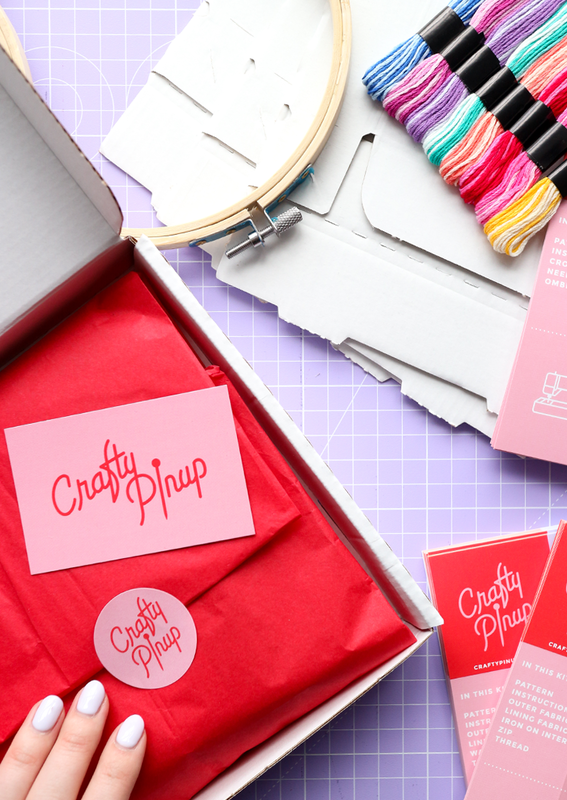 I wanted my sewing kit supplies to fit into a small square box, which could be easily customised with my branding. I chose Lil Packaging's SL180 Letterbox Boxes in White, the box perfectly suited my needs and the one style means I can apply my different front covers and they still look professional and uniform (when I applied my first front cover to a box I did a little happy dance, the fit was perfect!). 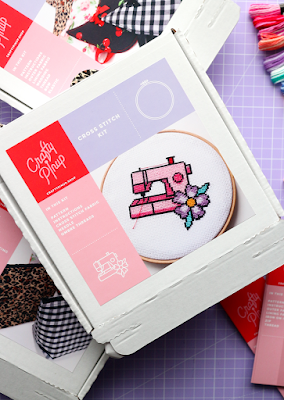 The boxes are easy to put together with their patented pop up style assembly and the adhesive seal means the kits are great for giving as gifts! Lil Packaging have reduced their prices across their main product line by up to 46% for lower volume orders. Meaning they are far more cost effective for small business owners like myself who don't buy massive quantities at a time. You can order as and when, which is great for me as I run my business from home and don't have a lot of storage room. Postages costs have also been reduced too, so it's a win win situation! 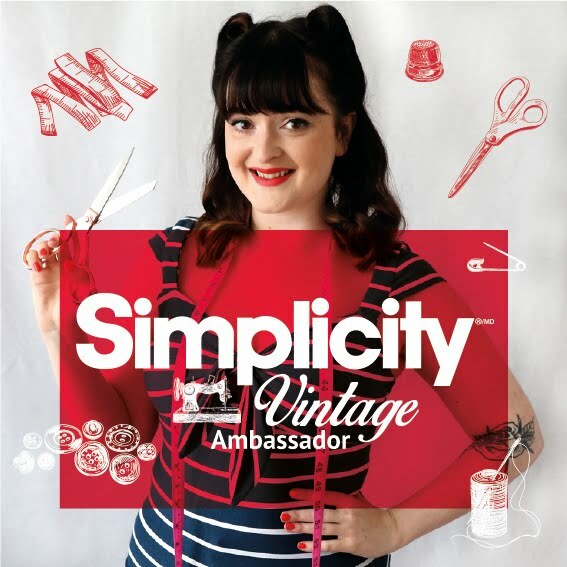 My Crafty Pinup range of sewing kits will be launching very soon. 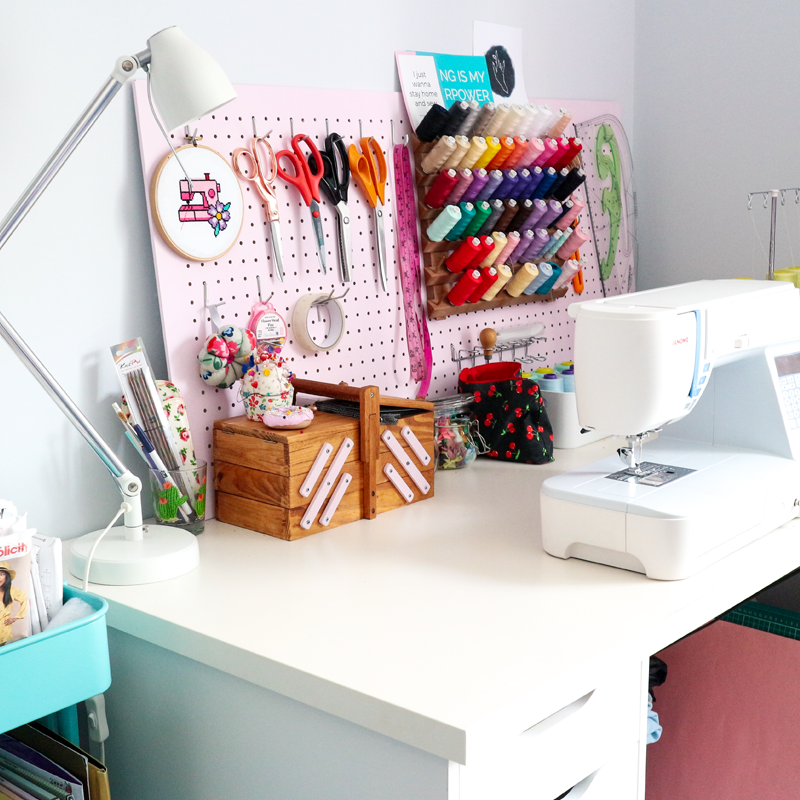 Featuring a cross-stitch kit with my signature sewing machine and flower design with a customisable colour palette to suit your sewing space perfectly. 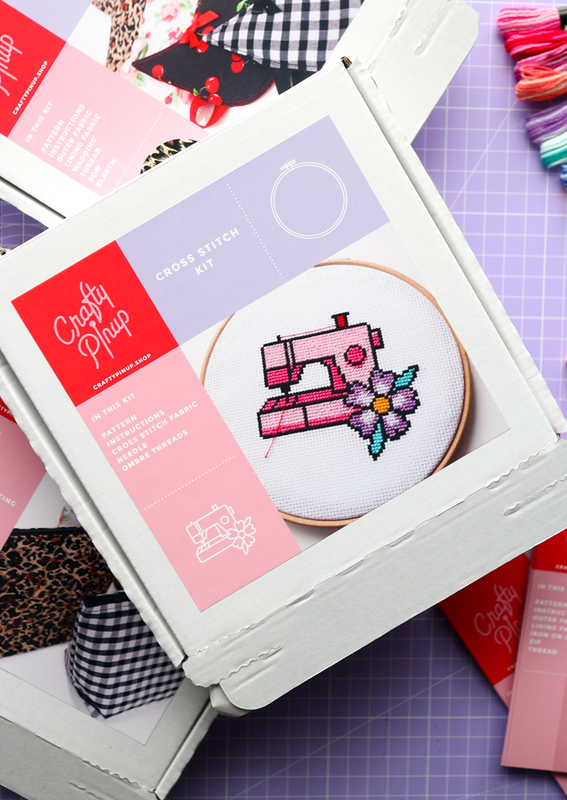 The kits are perfect for beginners and beyond who love a sassy fabric print and a crafty make to boot. 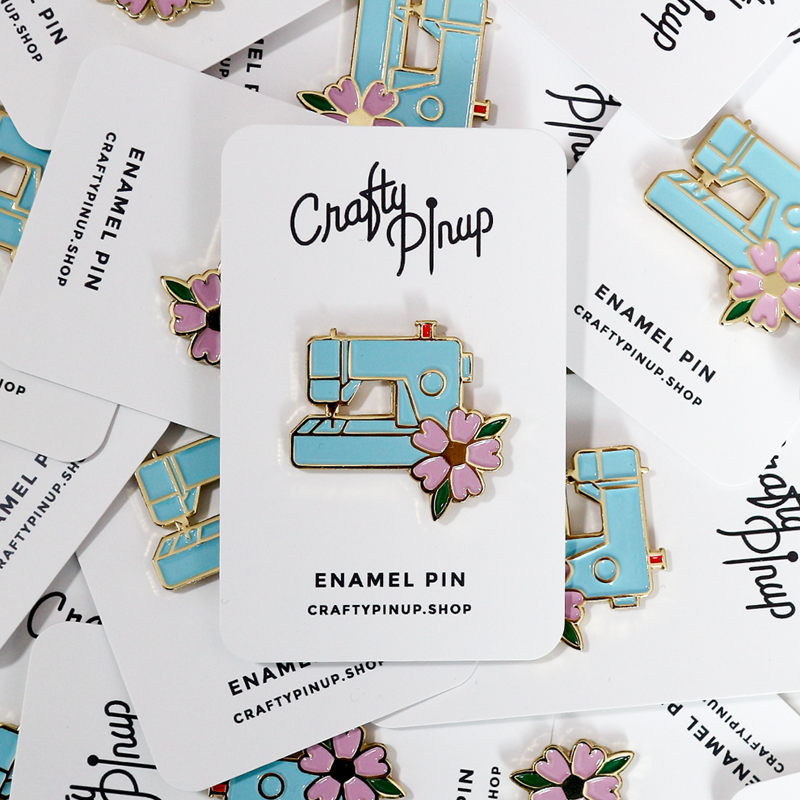 So keep your eye on the shop for a big restock of my pin & tote and of course the launch of my sewing kits! Get an extra 12% off your first order at Lil Packaging by filling out their short 10 second survey and signing up to Lil Packaging's newsletter and get FREE delivery when you spend over £40. So whether you're an Etsy or eBay seller and small business owner like me, now's the perfect time to try out some professional, affordable and eco-friendly packaging for your lovely products to elevate your business. Disclaimer: This post is sponsored by Lil Packaging.